And yes, they already tried parley . "It is magnificent, but it is not war. It is madness." Charging with light cavalry exactly once, in the middle of the enemy lines. Light cavalry are usually used for flanking, since their attacks lack either the power, reach, or the sheer crushing momentum of heavy cavalry to penetrate enemy lines. Following in the vein of old-style fights, complete and total lack of formation in armies that should have them. If you're dueling enemy soldiers unsupported, something's gone horribly wrong, unless you're part of a Bronze Age-type culture. Arrows on Fire: not necessarily a bad idea in and of itself, but rarely used for any reason other than Rule of Cool, unless used as a psychological weapon or to light targets on fire. Open-field, Napoleonic-style infantry battles with modern or futuristic weapons. We tried this in World War I. It didn't work too well. Modern armies fighting only with small arms, and no aerial or artillery support. Always using More Dakka for anti-armor or anti-air (or against a single, agile target), rather than guided missiles (in a setting that has them, of course). Always using missiles or other weapons that take a long time to reload, even when a quick firing weapon would be more useful. No attempt to flank the enemy or distract them with covering fire. In space battles (or using aircraft), failing to consider the third dimension. Despite having the technology to lock and fire on an enemy beyond visual range, holding off doing so until one can See the Whites of Their Eyes. Not to mention simply not having BVR (beyond visual range) technology in a setting that has other high-tech weapons and sensors (Minovsky Physics notwithstanding). Attempting—out of anything less than desperation—to use obsolete weapons, tactics, or styles of warfare against the very weapons and technology that rendered them obsolete (e.g. bows against repeating rifles, mounted shock cavalry against armored fighting vehicles, etc.). Exceptions would be if the story is intentionally set during a transition period in a civilization's technology (often leading to Curb-Stomp Battle for whoever's behind), or if it focuses on some isolated theater of war where factors such as terrain or underdevelopment force someone fighting there to use older tactics. No combined arms of any kind, meaning every other branch of the military is made obsolete with one weapon. Having access to Applied Phlebotinum that is good at concealing your presence, and then either doing something obvious to give away your presence, or making loud noises while sneaking around. Mook Chivalry, where the bad guys will, for no clearly explained reason, politely attack the hero one at a time instead of taking advantage of their superior numbers. Waiting until the last second to do a maneuver when not waiting is far more advantageous. Putting your general in the front lines. At least, so long as him fighting isn't a major part of your strategy or a cultural component of how warfare is waged. The use of cover that is either totally useless or downright dangerous. As in "You men stack the barrels of gunpowder and torch oil over there as a breastwork". "Cooking" grenades is generally considered a bad idea, despite what a lot of modern First Person Shooters would tell you. Grenade fuses are NEVER precise, so counting to two or three seconds may simply result in the grenade exploding in your hands in the middle of throwing. Training programs that actively kill, injure, or psychologically destabilize recruits, by particularly cruel profanity-bombing sergeants and scientists who develops drugs/technology to keep them in line. The training programs used by most modern countries, while harsh and hostile, are designed to break down recruits and turn them into competent, disciplined soldiers. Pushing recruits to the point of death, injury, or becoming headcases does not produce effective soldiers and are generally avoided in Real Life. This doesn't stop authors from portraying The Spartan Way as some form of desirable ideal. This is often used to add drama to the story. After all, a story about an army performing a last-ditch attack against a superior foe is more dramatic than the same army slaughtering the other one because it forgot to defend its flanks. Alternately, it could just be because it looks cool. On the flipside, artillery barrages, Gunship Rescues, the mechanical speed and precision of a Cold Sniper blowing heads apart all have a macabre beauty if you're an observer, not a receiver. Furthermore, an Enemy that can defeat a Badass Army acting competently and using its advantages to the fullest comes across as much more dangerous and respectable than one that Curb Stomps a bunch of barely-trained, poorly-equipped conscripts. Some critics see Hollywood Tactics as evidence of evil "Hollywood's politics" insisting that the military is always bad/wrong/evil. The concurrent claim that they tend "to be averted in the works of writers who actually served in the military, or even have significant military experience, including (among others) John Ringo, David Drake, Tom Clancy, and Robert A. Heinlein", which however sees these authors' pro-military if not militaristic bent as more important than their actual military experience (Heinlein served five years in the peacetime U. S. Navy before having to retire due to tuberculosis, Clancy did not serve at all due to bad eyesight). It should be noted, that military experience does not guarantee immunity from proposing terrible tactics and strategies, as for instance a lot of the literature produced about "the coming war" by retired and active military men before World War I demonstrates. And in real life even the best generals can use self-defeating tactics on an off day, even Robert E. Lee had his Pickett's Charge. Sister Trope to Standard Hollywood Strafing Procedure. Supertrope of Onrushing Army. When played for laughs, this is General Failure. This Philips Carousel spot , which includes, among other things, police looking out the windows after a suspect while several other suspects are firing weapons right outside the door. Don't even try and figure out a sequence of events where police have somehow penetrated past several of the criminals, and have had time to summon SWAT, but don't have a secure perimeter. Many of the Contractors are bad about this, apparently buying into the "you're just walking guns" view and throwing everything at their enemies without bothering to actually make plans about doing so. However, the more competent ones tend to use better tactics; Wei, for instance, thought to aim for the support his opponent was perched on, and November 11 used his knowledge of his enemy's behavior to set a trap that Hei only barely managed to ninja his way out of. In fact, the survival lengths of the various contractors may be lampshading this. As a comparison, November 11th has relatively weak powers. Many contractors have one-hit kills, he only has ice powers. He survives the greater part of a season, by sheer competence with his powers and skills. August 7 can reality warp the area around his body. However, he behaves like a walking gun, and gets the Facepalm Of Doom. While Code Geass mostly focuses on small-scale irregular combat between giant robots that isn't supposed to reflect conventional warfare, the use of modern tactics is still limited or noticeably absent during the largest encounters. For instance, the final battle of R2 has the two sides start by positioning their flying mecha armies in outdated Napoleonic-style infantry lines and Schneizel even decided to arm his WMD arsenal using apparently unguided missiles, though this may simply be an example of Schizo Tech. The show also resorts to metaphors between chess and war that can be philosophically interesting but remain unrealistic. That said, Code Geass actually tried to subvert or play with several of these tropes: until well into the Lensman Arms Race, it avoided the "using robots even when it doesn't make sense" tendencies in other Real Robot shows as giant mecha could be seen fighting alongside tanks, rocket-equipped infantry, helicopters, artillery or stationary guns. Naval combat also included surface vessels and submarines, not just amphibious robots. Finally, several of Lelouch's strategies are nothing less than ridiculous, but he does display some military skill by relying on terrain, flanking maneuvers and manipulating the flow of information to the opposing side. One would think in Neon Genesis Evangelion that after the first few battles the generals of the U.N. would get the sense to spread out their ground forces and take cover, instead of lining them up just perfectly for a laser strike from an Angel. But no, they consistently order ground vehicles to line up and bunch up together in the streets. The humans in Blue Gender seem to have studied all possible battle tactics in order to do the exact opposite. To sum it up, despite their claim that standard weapons are useless against the Blue, they run around packing weapons that are so pitifully weak compared to what they could be packing, that they frankly deserve to die for their stupidity. During the battle of Marineford in One Piece, Whitebeard's initial tactic of emerging right in the middle of Marineford harbor is visually impressive and carries shock and awe, however it left him totally surrounded. (He did, however, stop to notice the Marine warships on opposing sides, and ordered his pirate allies to use their ships to fire on them, correctly noting that it was a encirclement plan. But by then, it was too little, too late.) Meanwhile, the Marines used actual strategy, including combined arms, flanking, fortifications, and psychological warfare. It is testament to the pirates' impressive resolve and power that it isn't a total slaughter from the very beginning... though about halfway through, it becomes clear this will not end well for the pirates. In Sound of the Sky, putting your infantry right in front of your tanks (even if they are lumbering SpiderTanks) and making them charge at each other in the nearest plain lampshades that even military tactics were lost in the Apocalypse. The SEARRS troops in Mai-HiME: Engaging targets on an open field without any attempt to use fire support, not even snipers. Knowing that the enemy has at least one air asset but not bringing your own air cover or even sufficient anti-air. No attempts made to locate and neutralise the enemy's headquarters to force a decisive victory. The list goes on. Subverted, mostly. The story begins with the Starfist-like claim that the eponymous Objects (a form of Humongous Mecha) have obviated combined arms tactics because they're all but invulnerable to anything that isn't another Object (the first Object survived a direct hit from a submarine-launched nuclear warhead and remained sufficiently intact to finish off the opposition). Warfare has since devolved into "clean wars" with the unwritten rule that if your Object is destroyed, you surrender the territory and leave. The opening Story Arc proves that this not, in fact, the case when a special forces-like infrastructure raid destroys an enemy Object even after it had destroyed the friendly one in the theatre. Since the opposing faction had invested their entire war budget in the destroyed Object, a subsequent counterattack by surviving tanks and infantry captures the enemy base. That having been said, in the anime adaptation, the prologue shows the aforementioned submarine surfacing to launch its missile. Ballistic missile submarines have able to launch from below the surface since 1960 and no modern boomer uses surface launch. Captain America: The main character is supposed to be the greatest battle tactician in the Marvel Universe, often leading teams of heroes into battle. Usually, he simply shouts "Hit them hard and fast" before a fight and that somehow translates into perfect battle tactics. In the early days, he would also tell The Avengers to switch opponents if they were involved in one-on-one battles. Not only is this not a good idea since it opens the heroes up to getting hit in the back but the villains should be able to hear him anyway. Played straight, averted, and inverted at the same time in Harry Potter and the Methods of Rationality. Draco's army is based on tight formation and classical wizadry warfare. Hermione's often goes into more basing her entire strategy off of one single action or plan that either wins or loses the battle. Harry goes a route of mass chaos and randomness to throw off the other two. However, each army is usually well run and have well thought out strategies. Grammaton Clerics engage in countless shootouts without any thought to taking cover, preferring to run right into the middle of large groups and start firing in all directions. This is handwaved at the beginning, when it's explained that the Clerics studied gunbattles and had developed some mathematical system to predict and avoid gunfire. This is leaving out the fact that gun battles are dictated by terrain and lines of sight, which are inherently unpredictable, and most gunfights are based on suppression and teamwork within a squad, with liberal use of machineguns and grenade launchers. Additionally, anyone with a machinegun or shotgun (let alone grenades or mines) could take down a Cleric by simply filling the area with lead. The Mooks also show very little regard for even basic cover, preferring to stand out in the open and uselessly spray bullets from the hip while the Clerics mow them down. During the raid at the beginning, Prestor just stands in the doorway, while the rebels spray his location with submachineguns. Despite them knowing where he is, and him being illuminated by their fire, none of the bullets hit him. Violet uses Deadly Dodging to make at least a dozen different men on a single small rooftop shoot each other. They all obligingly lined up directly across from each other just to make this possible. Granted, the film more or less runs off of Rule of Cool, but the only time that the hero is wounded is when Violet loses two of her fingers during one of the many, many Curb-Stomp Battle fight scenes. Of course, it only shows up so her outfit can change colors, and after that, it's never mentioned again. Good-sized chunks of two fingers missing? Just a Flesh Wound, just cauterize it with the heat from your pistol barrel. Because a gun would be giving off that much heat. Take the scene where Violet is Storming the Castle, and none of the mooks think to engage her with shotguns, use grenades, use machine guns, etc. This culminates in a scene where she walks across a long, exposed bridge which is the only way into the inner sanctum, without encountering a single sniper or mine. Then she gets to the pre-sanctum room, and the guys with swords are in front while the gun-toting guards are in back. Not only is it impossible for the guys in back to fire without hitting the guys in front, but they could've just shot at her while she was crossing the bridge. Independence Day. Numerous city-sized alien space ships appear all over the world, with the intent of annihilating mankind. How does the military start out attacking them? They only use fighter jets armed only with pissy little Sidewinders. A giant lizard the size of a skyscraper attacks, and the military decides the best course of action is to attack with infantry soldiers armed with anti-personnel rifles. Heavy machine guns, grenade launchers, rocket launchers, artillery, tanks, rocket artillery, any other form of armored fighting vehicle, bombers, fighters, gunships, battleships... basically anything else besides infantry are ignored almost entirely until the finale. Guided missiles are used early on, but not only are the missiles slow enough for GINO to outrun them they somehow can't lock onto him because he's exothermic. Helicopters. GINO is chasing helicopters around a city and for some reason the helicopter pilots completely forget that they can go up, out of his reach. They stay at head height the entire chase rather than just flying up and away. King Arthur: You have a wall. A huge, fortified wall. Outside the wall is a horde of Saxon barbarians howling for your blood. Obviously, the most intelligent tactic in this situation is to open the wall's gates and allow the barbarians to march in so you could face them in a fair fight with your poorly armed and outmanned forces. I can certainly see how Arthur became legendary. Played for comedy in Monty Python and the Holy Grail, in which Arthur's handful of knights charge the French castle on foot. Only Lancelot manages to reach the five-story stone walls, and he takes a single swipe at them with his sword before running away. Apparently John Cleese chipped the wall, which did not please the castle's keepers in the slightest. Terry Jones and Michael Palin revisited the locations and filmed them as part of the DVD release's special features. They found several chips still on the walls, apparently the result of multiple takes. This is very common throughout Star Trek. Star Trek: Nemesis: Enterprise security is fighting a Reman boarding party - both sides ducking behind conveniently-placed pylons and only coming out of cover to take a few pot-shots at the general direction of the opposing side. Even if they don't have anything equivalent to grenades in the future, they could use, say, an overloaded phaser. The old series often mentioned that to take a ship you needed to capture the bridge and engineering simultaneously or else the defenders would flood the life support with anesthetic gas and knock out everyone. This is never mentioned in the films. One review pointed out that the climax of the movie hinges on the Enterprise's transporter systems being down. Every single person on board apparently forgot about the independent units in the shuttlecraft. Also, shuttlecraft. When Picard is giving covering fire so Data can break through an encrypted hatch, none of the experienced Reman troops use a basic tactic known as 'fire and manoeuvre' (in which one fires while the other advances) preventing Picard from ducking out to shoot at them. The entire Star Trek series is full of 2-D Space, which makes no sense since these are spaceships that can go anywhere. There's also a disproportionate number of Fixed Forward Facing Weapons, which makes no sense for the same reason. Star Wars is either in love with this trope or owes it money. In The Phantom Menace, the Trade Federation lands its mechanized invasion force in the middle of a swamp, at least a day away from the capital of Naboo, Theed. Theed is surrounded by large open fields - in other words, perfect terrain for an army composed mainly of droids and heavy tanks. Attack of the Clones had thousands of infantry in a slowly advancing skirmish line in an open field battle involving lots of heavy weapons, and Revenge of the Sith had numerous occasions of clones running headfirst at heavy armed and armored droids (and they were being cut down by the dozens as a result). It is pretty good by Star Wars standards, considering the Imperials were denied aerial and orbital support by the shield generator and the Rebels were only stalling for time, but it still has the Rebel pilots charging headfirst at vehicles that could only fire forward, and the Imperials having vehicles that could only fire forward. Apparently, "Attack Pattern Delta" involves flying directly at the only guns the enemy has. Who exactly wrote with the Rebels' playbook? Also, the weird choice of vehicles, as "the Sith Lord himself expressed serious doubts about his soldiers' tactical choices" in Great Military Blunders of the Galactic Empire . The Battle of Endor in Return of the Jedi is a subversion. Ackbar orders his fleet to get so close to the Imperial ships that they can practically See the Whites of Their Eyes, but this is only so that the Death Star can't fire without destroying their own ships as well as the Rebels. The opening battle of the film has Poe Dameron take his single X-Wing in a frontal attack against a First Order dreadnought, the Fulminatrix, to disable its deck guns so it can't defend against the bomber attack that follows. Reasonably okay except for the fact it's Poe hitting the dreadnought solo. The bombers take the form of vehicles that must drop their unguided bombs from underslung bomb bays, using a handheld trigger, so that they fall onto the dreadnought from directly above, all of this taking place in space, i.e. zero gravity. Additionally, they're flying in such close formation that the destruction of one bomber by enemy fire also takes out several others. The sequence is clearly another George Lucas Throwback to World War II movies, but a badly misplaced one. The Stern Chase sequence leaves completely unexplained why the First Order fleet doesn't simply Lightspeed Leapfrog the Resistance fleet so it can attack them from in front. The Battle on Crait is overall acceptable. The First Order uses proper combined arms tactics, complete with a wing of TIE fighters flying close air support to Humongous Mecha and the artillery piece sent to crack the Resistance's fortifications; the Resistance in turn entrenches itself with artillery of their own, and unlike in The Empire Strikes Back they only attack frontally because the artillery is invulnerable from all other directions. However, Kylo Ren allows his personal feelings to get the better of him, ordering the fighters to chase after the Millennium Falcon instead of continuing to provide air support, which gives the Resistance ground forces a shot at the artillery. In the original Total Recall (1990) Arnie uses the hologram watch thing to fool some Mooks into thinking they found him. This is pretty understandable, except for the fact that the mooks, despite standing on opposite sides of him and thus being right in each others' line of fire, shoot at him anyways. It turns out exactly how you'd expect. This is lampshaded, averted, and used as evidence that someone lied about his resume in the movie Ronin. In planning an attack on a convoy, Sean Bean suggests putting guys on either side of the street. Robert De Niro immediately points out that they'd be shooting at each other and calls him an idiot. The only guy (at least on the crusader side) who even tries to use tactics is the main character. Everyone else does things like trying to march through miles of desert in full armor without any water to attack people who are threatening your fortified city. Although this was actually Truth in Television. Averted in the case of Saladin. When his armies and those of Jerusalem are facing each other outside Kerak, despite having slightly larger numbers, Saladin backs down. Confronted by one of his generals afterward who rages that the results of battles are determined by God, Saladin counters that yes, they are, but also by planning, tactics, lack of disease, and availability of water. Since he came into Kerak half-cocked expecting to face a relatively small garrison instead of the entire Jerusalem army, he decides to fall back and wait for a better opportunity. In Avatar, the Na'vi attempt an unsupported, unarmored cavalry charge against a prepared line of space marines armed with machine guns. This tactical error could be excused by the Na'vi's lack of knowledge about human weaponry, except that in this particular battle the Na'vi are actually being LED by an ex-space marine.note The closest thing they have to an excuse is the fact that the marine in question wasn't with the troop doing the charge at the time. The group he actually is with, leading directly, does much better. The defenders have their archers on clifftops and sit at the bottom of a narrow and highly defensible draw. Rather than use their superior position to their advantage, they decide to charge the enemy over open ground, beyond the range of their supporting archers, with a non-expendable person leading the way. The bonehead army is swiftly and predictably routed. The same thing pretty much happens in the first film as well. Lining up and trying to face a numerically superior army (it's also apparently superior in weaponry, though the evidence doesn't really support this) instead of, say, having the cavalry try and maneuver around an enemy army doesn't really occur to them. It also fails to use their one advantage, as they have a diverse and disciplined army while the enemy is just an intermixed horde. Soldier contains this in spades. One of the more notable examples is the supposedly superior genetically-enhanced soldiers who evidence very little basic tactical sense. No evidence of any proper small unit tactics or knowledge of how to use cover at all. And that's just the start. Historically, the Scottish army during the Wars of Independence used massed pike formations known as schiltrons, combined with use of rough, often swampy terrain and the over-eagerness of Anglo-Norman knights, a tactic which was used successfully at the Battles of Stirling Bridge and Banockburn, but broken up by archers and heavy cavalry at Falkirk. The movie instead depicts every battle as wild, berserker charges across an open field into the English lines, success or failure being apparently determined for the most part by narrative necessity. It does acknowledge the use of massed pikes at Stirling Bridge, but in response to a single cavalry charge, and they are soon abandoned. The English charge at Stirling Bridge is a peculiar aversion in that it is actually less stupid than the historical events; the film depicts a charge across flat ground at a foe apparently lacking polearms, while historically it was a charge across rough ground and across a narrow bridge at massed pike, ending exactly as you might expect. The squad comes across a machine gun nest apparently operating all by itself and decide to take it out. However, despite having the element of surprise and a sniper, the Captain orders them to charge it over open ground directly into the killing zone the Germans had created. And he sends the unarmed Medic up the middle for no reason. The troops start What the Hell, Hero?-ing before they even start the attack. To make it worse, this very "charge the MG nest" strategy had several of his men killed on D-Day. Possibly the scene is meant to show the Captain succumbing to PTSD. Then there's the film's climax, where an unimportant and replacable bridge is defended at all costs. Major Winters, of Band of Brothers fame, said he never would have done something that pointless, to which he was told it wasn't dramatic enough. The Last Samurai: So after more than a year of training the Japanese army has a well trained officer corps, soldiers who can finally shoot straight, and all the cutting edge military equipment that the late 19th century has to offer. In the final battle, however, once the samurai retreat from the initial artillery barrage, they send their troops over a hill in pursuit and run headlong into a samurai ambush that ends up destroying the majority of the army. The opening battle of Gladiator has the Roman army using fire arrows against the barbarian army. However, this is justified as a psychological tactic -especially with the napalm catapults- and a distraction, so that the barbarians wouldn't notice the Roman cavalry ambushing them from behind. The rest of the battle is fairly sensible, with the legion keeping ranks and using ambush tactics, as they would have in real life. Pirates of the Caribbean has elements of this in the second two films (such as the climactic battle in the third one), but averts it in the first. The pirates note that the Black Pearl is going to come at the stern ("crossing the T") so that they won't even be able to return fire. It's only some quick thinking by Elizabeth that nets them a 90 degree turn and gives them a chance to shoot back. The "using arrows on fire at night" tactic is used in Timeline. Subverted, though: The point of the fire arrows was so that the attackers wouldn't be prepared for the "night arrows," which were simply unlit arrows. In Con Air, the National Guard and state police are moving in on the convicts' plane at Lerner Airfield. In long shots, you can see that the airfield is surrounded by open desert on nearly all sides, and the guardsmen have Humm-Vees and other offroad vehicles. They could and should have approached from multiple directions and focused on reaching the plane first. They choose instead to drive directly through an aircraft graveyard, setting them up for an ambush which the cons spring on them, killing dozens and slowing them down enough that the plane takes off again. Perhaps the idea is that the good guys didn't want the bad guys to see them coming, but it's not made clear in the film. 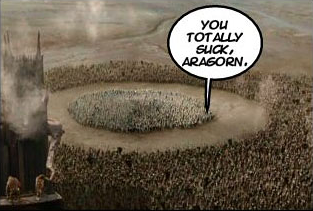 Peter Jackson's The Lord of the Rings movies have been parodied in DM of the Rings in this respect (as pictured above). The Rohirrim defenders of Helm's Deep let the Orcs neatly form up outside the fortress without shooting - until one bowman prematurely does, which (only then) provokes the Orcs to charge. In the book, their scouts or advance-guard shoot at every Orc stupid enough to carry a torch on the trip up there, before retreating into the fortress. The Rohirrim cavalry charge head-on at the giant Oliphaunts, swatting at their legs, goes exactly as one would expect. However, this was due more to real-life considerations than artistic license. According to the DVD commentaries, going by the book - shooting the Oliphaunts in the eyes - was deemed too gruesome and reminiscent of animal cruelty toward real elephants to be filmed. The Return of the King includes an intentional example. Faramir is forced to make an unsupported cavalry charge across open ground against a fortified position. Said position being an urban environment with lots of rubble in the streets that would handily take away all of a horse's speed and maneuverability. This goes about as poorly as one can expect and was meant to display Denethor's failing sanity. In the battle before the gates of Mordor, the heavily outnumbered and surrounded Army of the West break ranks and charge into the enemy, whereas in the book they hold their formations on higher ground and let the enemy come to them. Also, in the film version they arrive on war horses but inexplicably dismount and attack on foot. Ships are parked in orbit right next to each other, so Bug anti-space weapons can take them out easily, hit after hit. Bonus points is this problem is mentioned by the humans as one of the reasons the attack failed. The humans fight a ground war against an enemy that is planet-bound, instead of simply nuking the place from orbit. The attack force is light infantry (not mechanized), with no armour or air support. While the lack of armour support is Hand Waved by statements that the terrain is unsuitable for tanks and the like, there is no justification for a lack of air-support, either for bombing or rapid deployment of troops, especially when they're shown to have such capabilities. Human infantry are squishy, heavily-outnumbered and armed with weak but massed ranged weapons. Rather than set up kill-zones and Defensive Feint Traps and make use of explosives to counter their numbers, they simply send the enemy rushing over to fight the bugs in a Zerg Rush. Not very good when the enemy is the actual Zerg. Poor morale and troop cohesion, with the whole assault turning into a panicked rout after only a few casualties. There seems to be no established ground game or grand strategy for the planetary invasion. The troops simply land on the surface and run around in a confused mass, attacking Arachnid forces as they encounter them. Dawn of the Planet of the Apes: The apes begin their attack on the surviving humans by charging down a narrow street, thickly packed together and making no effort to seek cover. Though they do eventually succeed in capturing the humans, they take heavy casualties in the process. The Magnificent Seven (2016): The final battle is a perfect example of just how effective these tactics would be against an opponent who uses actual tactics. On the attackers' side, Bogue's goons ride straight towards the town in a mad charge without bothering to check what possible countermeasures might be in place, all the while Bogue makes no attempt to use the Gatling gun he brought along until after most of his men had gotten either slaughtered... or pinned down in the line of fire. The defenders on the other hand employ every single force multiplier available to them: using skirmishers, a variety of traps and obstacles, fighting trenches, sharpshooters in elevated positions, and exploiting the terrain (and the poorly-thought-out tactics of Bogue's hired guns) to lure his men into a series of ambushes. That said, Goodnight and Billy meet their end because they made the critical error of sniping from a very obvious location with limited cover, despite the fact that the film made a show of them discussing the pros and cons of various locations ahead of time. Snow White and the Huntsman's beach battle is a hilariously bad depiction of medieval warfare. On one side, Snow White's army attacks the castle in an unsupported cavalry charge the defending soldiers can and do see coming from miles away. On the other side, the soldiers don't even take the most basic defensive measures like closing the gates and portcullis, letting said cavalry charge right into the courtyard. Using Hollywood Tactics is a good way to die in the series. Mat won a One Sided Battle when 10,000 soldiers made a charge against him, and his army all knew how to use crossbows. The result is that while Mat lost some people, he killed the entire enemy army. Dumai's Wells at the end of the sixth book, where the enemy army's Zerg Rush tactics were defeated in a very bloody fashion. And the Aiel are basically the Zulu, from the ridiculous running speeds to the spear-wielding and war chants down to the page relevant tactics: split the army into four divisions, one to pin, two to the flanks, and a reserve. Rand himself tends to employ Hollywood Tactics at times, with similar results. He's usually self-aware enough of his poor strategic skills to let his generals make the battle-plans, but when he's being stubborn like in the battle with the Seanchan in Path of Daggers expect a bodycount in the thousands. Firing trebuchets in the middle of a fighting crowd. And again in Inheritance. For instance, the Varden launch an assault on Dras-Leona to cause a diversion so that Eragon can open one of the city gates. By attacking that very same gate. Naturally, this means enemy forces regroup there, blocking Eragon's way and forcing him to fight at three against hundreds. Subverted in Kurt Vonnegut's The Sirens of Titan: humanity is able to beat a Martian invasion because Martian 'strategy' consists of light weapons and infantry, announcing their position over radio to the militaries of Earth and stretching their armies to attack every country at once. The book portrays this as terrible planning on the part of the Martians... until we learn that actually, Rumfoord had deliberately made them use terrible tactics, in order to make them easy to beat, yet still seem like a scary enough enemy to encourage the nations of Earth to co-operate. In S. M. Stirling's Emberverse novels, gunpowder and electricity suddenly stop working, forcing the characters to painfully re-learn medieval military tactics. A more specific example: in A Meeting at Corvallis, Sauron-wannabe Norman Arminger ignores pointed warnings from his subordinates and, instead of picking off the various factions opposing him one at a time, launches a massive three-pronged attack that instantly unites everyone against him and ends in general retreat. The Novelization of Command & Conquer 3: Tiberium Wars has this in spades. Among the most egregious examples of tactics in the book is a scene where a Juggernaut artillery walker attacks a Nod machinegun emplacement. Does it use its cannons to bombard it from a distance as artillery emplacements are supposed to? No. Does it blast the emplacement directly with its cannons? Nope. It charges the emplacement and steps on it. Aside from the obvious stupidity of doing that, what kind of idiotic commander puts his artillery close enough to the enemy that it can step on their gun emplacements? Especially when the Juggernaut only has legs because it is supposed to stay out of the line of fire in the first place? The books in general have explained that the Sto Plaines generals are more concerned about becoming famous for their battles than winning them. They refer to the result of battles as "Glorious Casualties" and their tactics are explained as sending their army against the opposing one and counting the resulting losses; if they won it was a nice bonus. Conversely, the book introduced the reader to the famous general Tacticus, whose book Vimes reads at some points. Tacticus is considered a very dishonorable general by Ankh-Morpork's nobility, simply because he not only won battles but managed to keep a large part of his army alive in the process, mainly by avoiding this trope. Sergeant Colon also talks about his time in the armies. He mentions one commander who made them form up in arrows to march on the enemy, as that's how they were depicted in his books. In the book Pyramids the Tsortean and Ephebian armies are lining up to face each other, and both sides build a load of wooden horses and hide in them. Averted in Eric, when the besieging army builds a wooden horse, and when the defenders are all gathered around it waiting for it to open, they sneak in through the back door. Averted and played straight in Codex Alera. The Alerans, being the descendants of a displaced Roman Legion that ended up in another world, use classical Roman tactics, particularly the famous, highly-disciplined shieldwall. These tactics are, however, adapted to make greatest use of the Alerans' control over their furies, with specialist formations within the Legion made up of troops who are best at a particular discipline. Firecrafters are used as siegebreakers, metalcrafters and earthcrafters are used for shock attacks, woodcrafters serve as scouts and snipers, etc. The biggest problem that the Alerans have is that their overreliance on furies, coupled with an extremely conservative mindset that breeds arrogance ensured that the Alerans forgot many mechanical principles and thus tended to discount enemy technology that doesn't rely on furies. When they encountered Canim troops with "balest" crossbows, they were utterly unprepared for how powerful they were, and the idea of using seige engines instead of furycraft to bring down walls or fight massed enemies never occurred to them until Tavi and his mentor uncovered ancient catapult plans and sent them to Bernard, who did build them to fight the Vord. The battle tactics used in The Malazan Book of the Fallen series aren't necessarily bad; they'd probably work pretty well if used by Real Life generals during ancient times. However, in their world, magic exists, and it can be just as powerful, if not more powerful, than any modern weaponry, something which most generals seem completely unprepared for. Most of the time, marching their soldiers across the countryside in large formations just makes them sitting ducks for High Mages, who can kill hundreds with a single sorcerous blast. The Starfist series contains several blatant examples, particularly with the issue regarding uncombined arms. For example, tanks are not used because they were rendered "obsolete" because of "Straight Arrow" anti-tank weapons that essentially consisted of a one-shot unguided missile launcher/kinetic kill weapon - essentially a high-tech AT4 or RPG fused with an anti-armor rifle capable of penetrating tank armor. While such a weapon would be effective against tanks, all it is realistically providing is a reliable, relatively short-ranged anti-tank weapon portable by infantry. Realistically, it would cause a significant shift in armored cavalry tactics (use of more infantry screens, less use of armor in built-up terrain, etc), but not a complete decommissioning of the entire armored cavalry branch. The whole notion gets quite savagely lambasted here. The general impression given by the Starfist books is "light infantry are better than everything" which has decidedly never been the case since World War II, but the books are insistent on the infantry in general and the Space Marines in particular being the very best. Artillery and aircraft and armored transport are present, but all the combat boils down to foot infantry fighting enemy foot infantry. The aforementioned issue with tanks is just one symptom of a sort of antipathy the books have in general toward the idea of modern, mechanized warfare. The real galling part of it is that somehow, the Straight Arrow manages to obviate the very real, pressing infantryman's need for heavy mobile support weaponry. The availability of potent anti-armor weaponry won't take away the fact that the troops on the ground are going to need firepower support when faced with strong, dug-in opposition. But the light infantry don't have any support weaponry beyond man-portable gear, despite the fact that flying, missile-armed drones are available in the setting. One would expect to see cheap, teleoperated, tracked or wheeled drones with support weapons, design to be compact and lightweight (and above all else disposable) to be used to support the infantry in response to the Straight Arrow, with armored vehicles serving as a mobile cavalry outside urbanized areas where they can use their extreme range to bombard targets from outside an Arrow's range. Guy Sajer's supposed autobiography The Forgotten Soldier chronicles the author's passage from the rear-echelon supply services to the front lines with the elite German Grossdeutchland division. He describes training for the elite storm infantry as the worst sort of lunatic training with recruits being worked for thirty-six hour periods and only allowed, at most, six hours sleep in every two days. Men are regularly killed in live-firing exercises and those who refuse or want out are chained up like dogs and eventually shot for refusal to obey orders. In the Chronicles of Thomas Covenant, the character Hile Troy is hailed as a military genius by the people of the Land (and he was also a brilliant tactician on Earth), but his battle plan is terrible. He relied on only one scouting party to gather intelligence, and even if everything were to go according to plan, he would march his army hundreds of leagues to a canyon in the lower land to ambush the enemy army. Meanwhile his army would be tired and low on provisions, so the enemy would have to be vanquished in a only a matter of days. If the enemy chose not to take Hile Troy's bait in the canyon, then the land would be defenseless with Troy's army holed up at Doom's Retreat. And just like the real world, the best case scenario is not what happens, rather Lord Foul's army is too big and his scouts are delayed in delivering intelligence to Hile Troy. In Mockingjay, Beetee discusses videos of how people in the past had all sorts of nifty military weapons, such as jet planes and satellite lasers. Hey, what about those guns that fire really long distances... you know, artillery? That and laying siege to Capitol would have been a better option than sending in waves of men and women to just die needlessly. This is basically the only reason why any notable characters die. Carrera's Legions has some absolutely horrendous tactics, especially in the training for the titular Legion. Among the insanity is Carrera ordering NCOs to have recruits toss live grenades on their first time on the grenade-throwing range (a tremendous no-no in every single competent military in the world) and even ordering them to "cook" the grenades by counting to three before throwing them, which have four-to-five second fuses. (In reality, this would almost certainly result in the grenade exploding in your hand or face while throwing). He then improvises a tank firing range by having recruits drive out into a bay with power boats and drag targets behind them, and as an afterthought tells the civilian shipping using the bay to clear out. Coupled with other brutal training methods, the Legion ends up suffering 1.5% attrition before it even enters combat, which is a higher loss rate than any First World nation has ever suffered in any war after World War II, let alone during peacetime. What makes this particularly absurd is that the author, Tom Kratman, was a Lieutenant Colonel in the US Army, and thus would by all rights actually know how terrible this is, but the book portrays this lunatic casualty rate as desirable. The Gaunt's Ghosts novel "Straight Silver" has the Ghosts being thrust into a planetary civil war where the governor has insisted on WWI-style trench warfare for the past 40 years. Gaunt frequently voices his displeasure at the use of tactics that have been out of date for nearly 39,000 years and tries to convince him not to waste his men's lives so casually. In the Ciaphas Cain series, the fresh-out-of-the-schola Commissar Forres seems more concerned with driving troops to show their valor and be willing to sacrifice themselves for the Emperor than actual efficient strategy. The 597th Valhallan's commander, Colonel Kasteen, calls her out on this, pointing out that using actual tactics tends to result in higher damage inflicted on the enemy while incurring fewer casualties, which in the long run counts more than just trying to show off one's courage. In the first half of World War Z, every single armed force of the world (save for Israel and... that's all) holds the Idiot Ball until the world gets really screwed. Armies make bad decision after bad decision that caused the apocalypse. This reaches its peak at the Battle of Yonkers when... let's just say we're gonna need multiple bullet points with detailed footnotes to even begin scratching the surface here. This is one of the crowning examples of the trope. They don't bring enough ammo to deal with all the zombies that come, despite knowing the capital importance of that battle. note This is Handwaved as the military being overconfident, but it goes against the normal US military doctrine which says that There Is No Kill Like Overkill, that is also used as a PR strategy ("Shock And Awe") as well as for serious warfighting. They blatantly waste the little artillery ammunition they do have by firing full salvos at a few dozen scattered zombies in the van, while completely ignoring the gigantic horde of zombies in plain view less than half a mile behind them.note This is entirely contrary to sound artillery doctrine, which is to aim large salvos at the center of large concentrations of enemy and not at their outermost leading edge or at small isolated groups. The formation used is straight out of the Hollywood manual. The military entirely ignores available high ground and sets up their fighting positions at the lowest point on the map, without so much as placing even lookouts or snipers or artillery observers on nearby high points. While the military does perform with minimal competence in setting up at a natural terrain chokepoint, they then entirely fail to have the combat engineers erect fortifications or clear lanes of fire to best take advantage of that chokepoint. Likewise, all of their strength is laid out essentially in a single line with no defense in depth, minimal or no interlocking fields of fire, and no reserve element held back to reinforce against penetrations as needed. note The military state of the art had advanced beyond this kind of tactical layout before the end of the Bronze Age. The Assyrians understood the concept of holding back at least some elements in reserve in order to have them available to reinforce vs. enemy breakthrough or exploit sudden opportunities. Also, in a classic Hollywood Tactic, the artillery does not fire very far (if at all) outside of visual range, despite MLRS having a maximum range of approximately 30 miles. And a minimum range of several miles. The military doesn't have even a rough order-of-magnitude estimate of the number of zombies they're actually facing. This despite having every form of aerial and satellite recon potentially available and facing, well, zombies, who don't actually hide or have the ability to attack anything outside of arms' reach — especially not anything flying. For some reason, most tanks are given sabots, anti-tank non explosive weapons useless against large crowds of humanoids, instead of the much more logical antipersonnel munitions appropriate for that case. note This is particularly egregious because in recent history the Army was ready to design an entirely new ammunition type for the Abrams main gun for use in Iraq (optimized for use against obstacles and improvised fortifications), rather than choose to use sabot for a job it was not good at. They dig foxholes and use an infantry static defense backed by stationary AFVs, instead of using a mechanized defense and maneuver warfare. note Foxholes are used as protection vs. gunfire and artillery, two things zombies have absolutely none of. In addition, pinning themselves down in foxholes entirely negated one of the two greatest advantages that humans have over zombies, their superior mobility. Likewise, apparently no provisions were made for a fighting retreat if necessary. note The fighting retreat is the classic tactic used by a smaller mobile force with excellent ranged capability when confronted with an advance by a much larger but slower force with poor ranged capability if there is nothing at the battle site itself that needs to be defended vs. capture, i.e., the exact tactical situation being faced at Yonkers. This is a tactic that was old before the Persian Empire was young, and yet apparently they've never heard of it. The zone the army fought on wasn't checked against hostile, letting zombies pop out, attracted by the sound of gunfire, and attack the lines of soldiers from behind. note Failing to provide for flank guard and/or rear guard when laying out fighting positions is an error as fundamental as holding onto the grenade and throwing the pin instead of the other way around. The military has standard procedures for maintaining at least some kind of watch on flanks and rear for units all the way down to a single fire team (four men). Sweeping an area for concealed enemy units before setting up camp on it is even more basic than that. And yet the military at Yonkers, despite being present in at least brigade strength, fails to do either effectively. While air support of at least some kind is present, it is both grossly inadequate in strength, composed of the wrong type of aircraft, carrying the wrong type of ordnance, and assigned to the wrong mission.note They sent advanced high-performance multi-role fighters instead of dedicated ground-attack aircraft like A-10s or B-52s, they used long-range stand-off weapons intended for killing single tanks miles away instead of area munitions intended for killing large groups of infantry right beneath you, and what helicopters were available were apparently all tasked to the job of carrying news media as opposed to, y'know, shooting at the enemy. Also, no close air support is even started until the zombies are already danger close, instead of the Air Force bombarding them the whole way in. note Given that a good B-52 arclight strike could have destroyed most of the zombie horde before it even reached Yonkers, this is another one in the 'inexplicably idiotic errors that even Private Dumbjohn could have figured out was a bad idea, yet an entire room full of generals somehow failed to' category. Babylon 5: The Legend of the Rangers. "We do not retreat, whatever the reason." A rather stupid tactic for a group known as 'Rangers', whose job often involves bringing back information on mysterious aliens of terrifying technological superiority. Doctor Who. Particularly noticeable in the new series' version of the Sontarans, said to be "the greatest soldiers in the universe", whose tactics consist of standing out in the open and shooting UNIT - rapidly shifting to standing out in the open and getting shot by UNIT when UNIT figures out how to overcome their gun-wedgifying technobabble field. Though the main characters in the series constantly use classically bad Hollywood Tactics, the M.A.C.O.s actually used real small-unit military tactics. Which makes sense as the Starfleet personnel were mainly civilian pilots and scientists, while the M.A.C.O.s were a combat-trained Space Marine unit. (T'pol claimed that she also had combat experience, but she never showed it. Of course she wasn't on the show for her military skills). No one even seems to understand body armor; even simple stab resistant suits would have saved the lives of dozens of security personnel. And there is a substance that can stand up to phasers and is light enough to make decent body armor: an episode of Star Trek: Deep Space Nine, "Blaze of Glory," mentioned barrels made of phaser-proof material, and said barrels were light enough to be jostled around by people. They weren't rare or expensive either, as said barrels were strewn all over the place. How come no one ever thought to make armor from those? This trope is even more glaring in Star Trek: Deep Space Nine since the series is far more militaristic than other Star Trek series. A list of all of the poor tactics would take up a page of its own, but one of the worst examples has to be the Jem'Hadar. Having the ability to shroud themselves from the naked eye and sensors they, naturally, close to close quarters and make themselves visible before attacking whereas the smart way to use such an ability would be to keep oneself shrouded and move invisibly along the battlefield wreaking havoc unseen. The Jem'Hadar also do the same "stand straight up and march like a 17th century Tercio" routine that Star Wars armies love, while the defending Federation forces shoot at them one-at-a-time with single bursts from a phaser rifle, instead of throwing a grenade into the Jem'Hadar ranks. The Borg use NO tactics at all, but they still win because of We Have Reserves, Zerg Rush, AND the ability to adapt to enemy weapons and tactics. They don't care if their units are wiped out, because the next units they send will have adapted to the weapons/tactics the enemy used to defeat the previous units. All that, and a Hive Mind which keeps morale from being an issue. An administrative/strategic example in Star Trek starting with Star Trek: The Next Generation would be the combining of the tactical officer and chief of security into a single role, essentially meaning that one person has to be both chief of onboard military police and the ship's "gunner." Also, there seems to be no separate 'naval combat' department. See something wrong here? Hey, let's send a ship captain, a medic and a security chief on a dangerous, secret and politically dicey mission instead of commandos who are actually trained for such operations. Let's also make sure the ship captain we send has information the enemy wants. Nothing bad is going to happen because of this at all. While we're at it let's send bridge officers on away and combat missions instead of purpose-trained marines like every other navy in history. The titular Mysterons. If you intend to wipe out "all life on Earth," whether in a "slow, but nonetheless effective" manner or in a single strike, you do not announce every plan, complete with schedule, to the world's security organization. Considering they broadcast all their plans in the form of simple riddles, never try the same thing twice, never change their stated plans, it's clear they're treating the war as a game. The interesting thing about the series is, despite the limitations they impose on themselves, the Mysterons sometimes manage to win. The aliens in the movie tend to stand around out in the open in brightly-colored uniforms, despite knowing that there are rebels who will attack them. When shooting starts, they tend to flock together, making themselves an easier target. At least those brightly-colored uniforms were bulletproof in the second miniseries. The aliens also tend to yell, "Halt!" a few seconds prior to shooting at anyone and continue to shoot even after their targets have rounded a corner or closed a door in front of them. The humans have their stupid moments, too. When Donovan made a bargain for his son, he agreed to trade himself for his son. The aliens meet the humans in a canyon where the humans have a very nice ambush scenario set up. Donovan and his son trade places in a tunnel, but no one thinks that maybe Donovan should just turn around and run back to safety, even though the aliens are completely at their mercy and the humans have no reason to honor the bargain, except to advance the plot and get Donovan aboard the mother ship again. Instead, he just happily walks into the custody of the aliens and ends up blowing the cover of two Fifth Column agents. All it would have taken would be a line of dialogue about how the Vs have air support, which was their main advantage over the humans. It counts as a stupid moment for the Vs two, since the Resistance's other leader and their tactical mastermind-slash-weapons supplier is at the meeting too. They could have killed three birds with one stone and kill them too, thus decapitating the resistance in one blow. The series finale of Buffy the Vampire Slayer has a doozy. Buffy's plan to even the odds in the coming battle of her gang of Potential Slayers vs. the hundreds of uber-powerful vampires lurking in the Hellmouth is to have Willow cast a spell that will upgrade them all to full Slayer status. Fine. But instead of waiting safely for a few minutes until the spell is complete and then entering the arena fully powered-up and prepared, they instead inexplicably charge into the Hellmouth and hide out on a ledge hoping not to be seen. They are of course immediately spotted, and have to begin the fight severely outgunned and hold the line until Willow finishes casting. Plus, she couldn't call in a few favors from Riley and get some grenades to help deal with the large number of Turok-Han that would be swarming at the base? Until their competence was upgraded in later codices, the Imperial Guard were infamous for taking the WWI approach to warfare, favoring wave after wave of frontal assaults. Nowadays this trope is either played straight or avoided depending on the regiment or commander in charge. The Armageddon Steel Legion can pull off blitzkrieg-style onslaughts with mechanized infantry, and the Elysian Drop Troops carefully coordinate air support for their tactical insertions. Meanwhile, the Mordian Iron Guard take to the battlefield in close order drill wearing brightly-colored dress uniformsnote Actually a Justified Trope in their case, as they live on a side of their planet in complete darkness because the other side is lethally hot, and they frequently fight Chaos. They use the uniforms and drilled formations to be able to actually see each other and keep morale up to be able to fight at all against insanity-inducing Chaos., while Colonel Chenkov of the Valhallan Ice Warriors got a medal after killing ten million Imperial soldiers by sending them against an enemy citadel without armor or siege support. While the Space Marines can use fancy tactics to win battles, and certain chapters are known for using a great deal of subtlety and finesse to achieve their victories, the Adeptus Astartes' superhuman physique and formidable wargear means that a Drop Pod assault right into the enemy's front lines is a valid and quite successful option. Note that since their military/religious doctrine holds that "camouflage is the colour of cowardice," they're going to be wearing their chapter colors the whole time. Gleefully embraced by the Orks, whose response to any problem is generally screaming "WAAAGH! ", blazing away with their inaccurate weapons, and trying to get into close combat with the foe. Due to their numbers and brute strength they can often get this to work both on or off the tabletop. In addition, they know camouflage is a bunch of colors painted on your uniform, but they don't know that the colors actually have to match the background. The Eldar take pains to avert this since they're a race on the verge of extinction. They use a combination of psychic foresight and a swift, highly-mobile army to strike without warning, achieve their objectives, and withdraw, ideally without taking a single casualty. Averted by the Tyranids, frequently to their opponents' detriment. Though they appear to be a tide of mindless beasts, the Hive Mind directing that tide is quite intelligent, able to lure enemy tanks into dense terrain where a single Carnifex can tear them apart, send burrowing organisms to disrupt the enemy's rear and sow terror and confusion, or send hordes of expendable Cannon Fodder to use up the enemy's ammunition before the real attack. Tyranids also are masters of We Have Reserves, because they measure their combat force in Biomass not bodies. A dead unit is just one that needs to be digested and reassembled. Hell, their frontline fighters aren't born with digestive systems because they don't need to live that long. This trope is also averted by them on the strategic level. In response to an Imperium tactic of burning planets the Tyranids are on the Tyranids have started breeding specifically to endure this. Additionally one of the Hive Fleets is attacking the galaxy from below, something that humans unused to thinking in three dimensions didn't even suspect for a long time. A minor alien race called the Thyrrus has this as their Hat. Their entire military strategy on any scale is based around what looks cool, and as a result they're impossible to predict on the battlefield - an impressive and dramatic defeat is as valued as a total victory, and huge casualties on both sides is their most-desired outcome. In Arms and the Man Captain Bluntschli explains to Raina why her husband to be, Sergius, was totally insane to take his entire division and charge straight into a nest of entrenched machine guns. It turns out that the attack worked and won the battle for Sergius's side but that was only because the machine guns were sent the wrong ammunition. Can be a valid tactic in the series due to the inaccuracy of guns, provided you have a general with enough morale bonuses under his belt. Works a little less well against cannons. Does not work at all, for obvious reasons, in the Napoleonic conversion. The enemy even in Napoleon has no problems charging cannons that can be set to fire grapeshot and temporarily boosted to reload faster. Of course, this is only possible because, unlike other games, Empire and Napoleon have unlimited ammo for artillery (but not infantry). At first glance, the Battle of Ostagar from Dragon Age: Origins has this in droves. We see such gems as: archers only firing one volley before sending in the hounds and soldiers, the army lining up outside their fortifications, archers firing into a melee and having the entire battle plan rely on flanking the enemy... who aren't even attacking in organized regiments. That is until we learn that Loghain Mac Tir, the King's greatest strategist, deliberately set up the entire battle to ensure that the Ferelden army at Ostagar would lose and King Cailin would be killed. Coupled with the fact that King Cailin himself is...not the brightest strategist and is focused on glory and storybook-style victories, and this actually becomes quite believable. The two cutscenes of Fire Emblem Tellius that show actual wars being waged are both utterly ridiculous instances of Gameplay and Story Segregation, considering that using cavalry, infantry and archers/mages correctly is kind of the whole point of the series. Instead, Begnion's greatest commander has... one million-man box - no divisions or formation, just a box - of spearmen, plus himself, who has a sword. All of them are on foot. When they engage the laguz, it turns into an enormous brawl, with everyone spreading out to dance around ineffectively at each other. It did include at least one ballista and a few armor knights, though not in any discernible formation. Fire Emblem: The Sacred Stones has Ephraim decide that it's a really good idea to assault a castle filled with at least forty enemies using only himself and his three most trusted knights. Because they had the element of surprise. The only reason they survive is because the player himself knows what he's doing and/or due to the Crutch Character that's with you. Does that count as Gameplay and Story Integration? He's said to be a worthy commander renowned for his tactics. Despite this, he shown to be both Book Dumb and Too Dumb to Live in various other cutscences. Throughout the series, marines are shown to be riding on the hulls of tanks. This tactic is known as tank desanting. While it had been used extensively throughout WWII by the Russians and Americans during Vietnam, it was mostly just to get from one place to another and soldiers would dismount as soon as combat ensued. Riding on a tank while under fire is an extremely dangerous thing to do given how attractive tanks are as targets from enemy fire. One would think that centuries in the future, we would not revert to tactics from the middle ages of armored warfare. Bungie basically admitted it was working off of Rule of Fun. At the beginning of the Halo: Reach mission "Tip of the Spear," the humans are seen attacking the Covenant with a huge crowd of Warthogs and a few Scorpions. Apparently they all forgot that the Warthog is a recon vehicle, and the tanks should go first. This also presumes they had more than a few Scorpions. After several days of Convenant invasion, when you gather together a bunch of stragglers, survivors, and the lost and make them into a counterattack, you're not going to have everything up to the standard TO&E. And Warthogs are a lot more likely to survive the initial 'run away and hide in the boonies' phase than Scorpions. Gets interesting in Mount & Blade: Warband multiplayer, particulary on Battle servers with random maps. Basically, it's a medieval combat simulator. Lately, there have been servers with sizes up to 200-300 players. Sometimes they use strategy and tactics. Sometimes it's every man/woman for him/herself. There are the skilled players that really can hold the gate or enemy advance on their own and there people who in a room with ten enemies manage to hit the only ally in range. It's awesome when a spontanuous shieldwall is made, covering the archers while the enemy cavalry is going for the loners and the flanks. Without built-in voice chat, co-ordination is fairly difficult but sometimes they still manage to pull off very nice manoevres. The 'everyone for himself' scatter tactic is the most common though, closely followed by 'stick together'. Although it is never addressed in-game, some level of tactics is definitely required to survive X-COM games. Many a Let's Play of X-COM spend a few minutes with the player outlining suppression strategies they plan to use while arming their men and then watch as they fail spectacularly. After they get together competent Psi/Molecular Control teams, tactics rarely venture beyond "make enemy kill themselves". In the early game your lightly armed and unarmored troops tend to get slaughtered by the aliens in any sort of firefight. A good tactic is to just blow up everything with high explosives and follow that up with cannon fire and grenades. In Metroid: Other M, Commander Adam Malkovich sends his men and Samus to investigate various areas of the Bottle Ship alone while he watches the security cameras from the control room, allowing them to be picked off by a saboteur and other factors. This is a decorated Commander, a former general in another military force, and he seems to have no idea of basic infantry tactics. Then again, this is the same guy who apparently thought restricting Samus' defensive measures as well as her offensive armament was a good idea. These trailers for two Star Wars games, The Force Unleashed and The Old Republic respectively. Rule of Cool aside, bad research is an understatement - the stuff some of them do is just illogical. Particularly notable is the fact that the troopers have both high-ground, surprise, and ranged weaponry against an opponent who largely deals in melee attacks, but their battle plan requires them to fire a few shots, then announce their presence by yelling loudly as they run up to the Sith and try to shoot them. Of course, given who their successors are, this is par for the course. Dawn of War contains numerous examples of this, either for Rule of Fun/Acceptable Breaks from Reality reasons, or one of the reasons listed in the Warhammer 40,000 example above (being in the same setting). In Fallout: New Vegas, General Lee "Wait-And-See" Oliver is a definite follower of this since as a Glory Hound General Failure, what he really wants is one big glorious slaughterfest on Hoover Dam that will make sure that he goes down in history and outshines Chief Hanlon, an actually competent tactician, at the cost of countless NCR soldiers. Robert House even lampshades this, referring to Oliver's "tactics" as Tunnel Vision. This is because his only move is to fortify the Hoover Dam with troops to prepare for an impending Legion attack and nothing else. He is apathetic to the situation everywhere else in the Mojave, even when the Legion establishes itself in the Mojave and engage in regular attacks on the NCR to crippling effects (i.e. Searchlight, Nipton, Nelson, Forlorn Hope, etc.). To that and to the regular Fiend raids, Oliver maintains his orders to hold position and not pursue, even when it's clear how these are all affecting their supply lines and morale. Upon closer inspection, the NCR is so bogged down by this and everything else that they are unable to take notice of or respond to further sabotage attempts (into McCarran itself), the involvement of the Great Khans, the breakout of the NCR Correctional's inmates and the total unpreparedness of their troops that it becomes clear that the NCR would've been slaughtered were it not for the Courier's intervention. Dwarf Fortress: no matter how careful you are with your military, there will inevitably come a point where they try badass solo charges against squads of goblin archers and end up shot to pieces in seconds. Or thundering in solo against powerful demons. Or otherwise get themselves killed in memorably messy fashion. Strangely inverted in the opening movie of Civilization VI. It depicts realistic WWII tactics like loose-order infantry advancing while firing on the run... except they're carried out by 17th-century Polish troops with muskets, who should be using old-school mass formations. Cry Havoc mainly averts this, but plays it straight when it comes to psychers. Their psychic powers can make them virtually bullet proof, and allow for some very hollywood-esq tactics including a one (wo)man Zerg Rush against dug in opponents. The rest of the time, the dogs of war and rebels use real tactics such as suppression, maneuver, misinformation, combined arms, and ambush reaction. Parodied in this Sluggy Freelance strip (or at least it parodies Video Game tactics, anyway). Val: Why are the cute ones always insane? Here's how to conduct a battle if you're an Orc chieftain in Dominic Deegan who is also a Native American. Your warband occupies a hilltop overlooking your enemy's camp. Many of your warriors are master archers, while the enemy tribe has shown no ranged weapons and no defenses beyond teepees. You must carry the day, but you're not counting seconds. It follows that you should lead a charge down the hill and take the enemy by surprise. Keep your archers back, but have them hold fire until the ranks have mixed and the enemy is occupied with your fighters. Then pour arrows into the melee, but only have them hit enemies. Fight nonlethally with your clubs, hammers, spears, and rain of arrows on a ballistic trajectory, since only the enemy chief is evil. Have all of this work until the chief overwhelms you with his magic, then give the order to kill by yelling it really loud in the middle of a battle. Get rescued by two different groups of allies that snuck up on everybody on what is largely a flat, featureless plain. Party down. G.I. Joe. Just to start, the opening for the movie has COBRA's apparent goal to be destroying the Statue of Liberty. After somehow getting an airship right above it, instead of using a missile or dropping some bombs, they send hundreds of paratroopers (who would be falling all over each other if they're that close) and a couple air vehicles down to set one time bomb at the base of it and they have ships for backup which didn't even try to do anything until they were within about twenty feet of the island and got blown up by Joe fighter planes. Transformers sometimes falls into this trap for large battles, especially aerial. For the most part it does squad-based action pretty well, if a bit static. (Thank goodness nobody ever thought to make giant robot-sized grenades a standard!) In the third movie, some prototypes of anti-Cybertronian grenades, usable by humans, show up. Both Star Wars: Clone Wars and Star Wars: The Clone Wars series display countless, repeated examples of this trope from the Jedi and the Republic in general, despite A) the clones being outnumbered by several orders of magnitude by the Separatist droid army (the latter manufactured in factories across the galaxy while the clones are only produced in a few small cities on one planet), and B) the Republic on the brink of winning the war by the time of Revenge of the Sith, pushing the Separatists to a handful of Outer Rim fortresses. This is despite the clones being allergic to cover and commonly meeting the droids (entirely viable) Zerg Rush tactics with their own, having minimal-to-non-existant armoured or aerial/orbital support, and generally being utterly useless unless a Jedi is around to help them (especially in the second series). The few examples of competency, for example the unbelievably badass ARC troopers in the first series, just rub salt in the wound. The largest example of this is displayed in the first few minutes of the pilot film. Despite the clones having ample cover and artillery support to hold off the large amount of incoming droids, once Anakin springs his 'ambush' (a staggering 5 soldiers), the clones immediately jump out of cover and charge the enemy droids head-on. They predictably get slaughtered. The Confederacy and the Union had been duking it out at Gettysburg for about three days. The North's position was so well established, that the South had attempted two major flanking maneuvers and had been repulsed both times. The Union has better fed, better equipped, and better trained soldiers than the South. Still, both armies had inflicted a similar number of casualties on each other. It was anyone's game, but the Union could not be allowed to gain reinforcements or further fortify their position. Between the two armies lay a large, open field. As an act of desperation, Lee decided he should take the least predictable course of action possible... running straight up the gullet in a dramatic but moronic attack. Never mind that they had to run into cannon range whilst leaving their cannons at ineffective range. Never mind that this sort of attack can only succeed when outnumbers the enemy pretty handily, but the South was outnumbered by the North. Early on the third day, the Confederates tried to use an artillery barrage to eliminate Union artillery. Henry J. Hunt, commander of the Union artillery, couldn't really see to return fire— but he deliberately stepped down counterbattery fire slowly to give the impression that the Confederate barrage was working. (That is, that the Union guns were going silent one by one because they were being destroyed.) Alexander fell for it; Lee followed suit, even though it was quite obvious even under Napoleonic tactics that the defending side had to concentrate its artillery effort on fighting the infantry charge and that counter-battery fire was an "optional extra" at best, a dangerous waste of ammunition and exposure of one's owns batteries at worst. See here . One factor that may have played a part was that not long before Gettysburg Lee had succeeded in sending an army that outnumbered his by a factor of 2 or 3 to 1 into full retreat at Chancellorsville, which may have led him to underestimate the morale of the Union troops and commanders, although after after two days of hard fighting he should have known better. Also worth remembering: Several charges every bit as foolhardy as Pickett's had been repulsed with ease by Lee's army at Fredericksburg a few months earlier. That a similar charges succeeded later that year as the Army of the Cumberland stormed Missionary Ridge at Chattanooga, could not be foreseen (it indeed happened without orders). The French commander at Minden (1759) thought that in view of certain peculiarities of the battlefield it would be a good idea to invert the standard 18th century formation of infantry in the centre and cavalry on the wings. This resulted in a large cavalry formation insufficiently supported by a little artillery running into the British and Hanoverian reserves (infantry supported by artillery). Said reserve was in line but presented no open flanks and thus it actually succeeded in pushing back the French cavalry. The battle of Marignano between the Swiss and the French. Granted, the Swiss pull this intentionally, to show the superiority of the pike over the cannon. And they might have too, if not for the Venetian reinforcements! The victors of the battle of Marignano would fall victim to this trope themselves—and by "the victors", we don't just mean "the French"; we mean "the exact same French people who were at Marignano"—at the battle of Pavia several years later. The French actually outgunned their Spanish/Holy Roman Imperial opponents in artillery by a wide margin; unfortunately, King Francois I decided to end the battle with a glorious cavalry charge. A charge which put him, his royal guard, and the cream of the French nobility directly between the French cannons and the enemy. Needless to say, firing was not an option. End result: The French are defeated, Francois becomes the first post-medieval French ruler to become a prisoner of war, and King of Spain/Holy Roman Emperor Charles V is supreme in Italy. As mentioned in the Kingdom of Heaven example above, Hattin . The psychological attacks made by the Whites during the Russian Civil War. Involved soldiers marching straight to the enemy lines, without ducking, ignoring bullets. Some generals added twists to the basic tactic: the Volunteer Army men smoked cigarettes while marching, General Slaschev's men ate sunflower seeds. The aim was to intimidate the Reds with the Whites' fearlessness. Usually it didn't work, but sometimes it did. Too many medieval armies to count fell into this due to chivalry. The Teutonic Knights fell victim to this during the battle of Lake Peipus. Abandoned by 4500 Estonian infantry, 500 Teutonic Knights failed to retreat as any sane commander would have ordered, instead charging straight into the centre of a balanced army of heavy cavalry, horse archers and Novgorod militia. 400 of the knights were killed, 20 of them members of the order, as their retreat was cut short by the ice underneath them giving way. The Mongol invasion of Eastern Europe also counts as this. The European armies at that time were centered around chivalry and honor. Tactics used were about as advanced as simply charging the enemy army, with the expectation that God would let the righteous win the battle. The Mongols on the other hand had very disciplined soldiers and excellent tactics. The Hungarians and the Poles had their armies completely annihilated through simple but brutally effective tactics. By the same force. On successive days. The Iraqi Army in 1991 deploying in Kuwait with its right wing sticking out like a "kick-me" sign. The Battle of Flodden (1513), the Scots got the high-ground, but it was so high that they couldn't depress their cannons enough to actually hit the English, who made good use of their own cannons. Placing most of their officersnote which is to say, the entire Scottish aristocracy, most of whom - including the King - died in the battle, throwing that country into disarray in the front line didn't help either, and the slope of the hill was such that they struggled to maintain formations when they did eventually charge. Repeatedly, on both sides, at the Battle of Waterloo, mostly by cavalry commanders. Soult's initial attack on the British line was for some long-lost reason ordered to advance by division column, presenting a huge target which was promptly shot to pieces. The British cavalry under Ponsonby defeated the first French assault and, apparently under the impression that they could win the battle in the opening stages, surged across the field until they reached the artillery positions, which they couldn't disable as they hadn't brought any spikes. Exhausted and out of formation, they positioned themselves perfectly for a French counterattack which all but wiped them out. Not long afterwards, Marshal Ney on the French side attempted to sweep aside what he thought was faltering British resistance with a massed cavalry charge. The results were predictable to anyone who was not Marshal Ney. Later in the day Ney wanted to try the same thing again (with a better chance of success this time) and Napoleon told him where to get off. As the Prussian army arrived and defeat loomed for Napoleon, he ordered the Imperial Guard forward in a glorious last-ditch charge. Napoleon had crushed a similar last-hope advance by the Russian Imperial Guard at Austerlitz and Wellington did the same thing to him. Custer's Last Stand is to (Non-native) Americans what the Charge of the Light Brigade is to the British. The reasons why this turned into a Curb-Stomp Battle instead of a Cake Walk are still being debated but several points are generally accepted. Custer decided to attack a force that outnumbered his significantly. This smaller force was split up into even smaller, separate units, inviting defeat in detail. The force with Custer was killed to the last man. The battle of Antioch in the first crusade. The crusading army was pinned down in Antioch, a city in Syria, where they had recently conquered the lower part of the city. What they did not conquer, however, was a fortress in the heart of the city, where the defending Muslims had retreated to. A relief force was sent by the ruling Turks, who controlled Syria and much of the rest of the Middle East at the time. This meant that the Christian army was not only outnumbered, but was forced to retreat into the city... where the Muslims garrison still hung on, even as the Turks were camped outside. To make matters worse, Antioch had fallen in the first place (save the city's fortress), because the Crusading army had starved the defenders into submission, meaning that there was little food in the city for the Crusaders, who now also starved. To make a long story short, the outnumbered and starving Crusaders charged the Turks in a straight-up frontal attack, and completely routed the larger army. Then the Muslim garrison surrendered in the city.